Mason men’s soccer team is now tied for fifth with Old Dominion and Hofstra with a 3-3-2 record. File photo. Over the last two weeks, George Mason men’s soccer has gone from a 0-3-1 conference record, tied for last in the conference, to a 3-3-2 record, tied for fifth with Old Dominion and Hofstra. While William & Mary sits atop the conference with a 6 point lead and a 6-1-1 record, Mason has been looking to get in playoff contention with their recent play. Going into their game against Delaware, both teams were tied with a 2-3-1 record. While Mason had the clear advantage in shots, 17-10, but only four of those shots were on goal to Delaware’s three. No one player on Mason’s side had more than one shot on goal. The real star of the game was the freshman goalkeeper Sean Core who recorded a clean sheet for his fifth shutout of the season. Playing Northeastern, Cote picked up another clean sheet with the help of his defense. Mason had a late goal in the game to seal the win. Senior midfielder Brent Brockman shot for the score from the corner of the box. 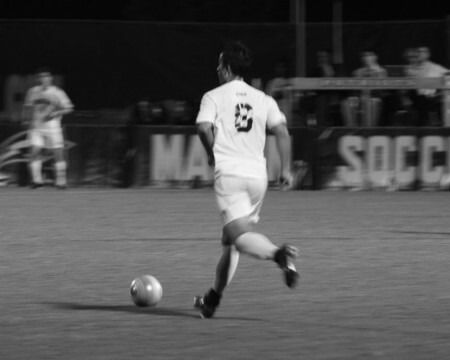 Freshman midfielder Alex Herrera and junior midfielder Ryan Gracia were credited with assists. To round out the season, Mason will play two teams with a better record, Georgia State (4-4-1) and the University of North Carolina-Wilmington (3-1-4), and Hofstra, who they are currently tied with. The final stretch of the season will decide whether the Patriots will be in the playoffs, and what seed they will have.